IRVINE, Calif. June 28, 2018 – To halt climate change in this century, heavy-duty infrastructure undergirding the world’s major economies must be redesigned – starting now – to ensure no increase of carbon dioxide in the atmosphere. 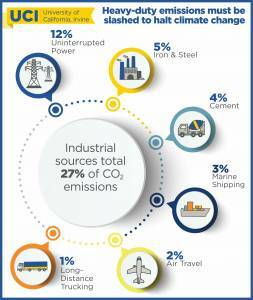 According to a UCI-led review due out Friday in the journal Science, that includes long-haul shipping, airline travel, cement and steel production, and a smoothly operating power grid. Industrial sources are currently responsible for 27 percent of all carbon dioxide emissions, or 9.2 gigatons per year. The international team of researchers warn that those numbers could rise sharply as more parts of the world are developed and as battery-run cars and solar and wind power slash emissions from those sectors. The paper examines key barriers, potential technologies, and research and development priorities. The work has important implications for policymakers as well as scientists. Possible solutions include the synthesis of energy-dense fuels for aviation and shipping, capturing and storing emissions from concrete and steel production, and the conversion of electricity into fuels. The authors highlight hydrogen, pointing out that fuels made from it and CO2 sucked out of the air could, for instance, replace a trucker’s tank of diesel gas that’s good for 1,000 miles, which a reasonably sized electric battery can’t do. But the initial cost per gallon could be as much as five times higher. Scaling up use of new technologies could help, the researchers say, as could integrating power and manufacturing facilities. For example, hydrogen could be made using excess solar power during the day and then converted back into electricity after the sun sets. Capturing and storing CO2 will also be key. Cement and steel manufacturing rely on limestone or “coke” coal that contains large stores of fossilized carbon. When the materials are heated during manufacturing, that carbon currently goes skyward. But demonstration projects have shown that storing CO2 underground is an option. The authors include experts in energy systems analysis and the specific technologies and processes examined. More than 30 scientists, engineers and others contributed to the review, which stemmed from a 2016 Aspen Global Change Institute meeting supported by NASA, the Heising-Simons Foundation, and the Fund for Innovative Climate & Energy Research. The National Science Foundation also provided funding (INFEWS grant EAR 1639318).